This is my standard ratio for a single pie crust. Double it for a top and bottom sheet. I only use butter, which gives the dough a better flavor and makes it puffier. Many things can be added to increase the crust’s flavor such as orange juice, fruit zest, and vinegar. Nuts with a lot of fat can be ground up and added as well, but the ratio of butter will need to be reduced equally. That means for every tablespoon of ground nuts omit a tablespoon of butter. When working the dough together don’t over do it. You want to form it into a smooth ball quickly. I like to refrigerate the dough for 1/2 hour before rolling it out. This chills the butter so it rolls out better. Cut butter into small chunks and add to flour. Using a fork or pastry blender cut the butter until flour resembles coarse crumbs. Take a handful of the mixture and clench it in your fist. If the flour comes together in a rough mass there is enough butter in it. If it remains too dry to hold together add a tablespoon of butter at a time until the consistency is correct. Slowly add ice water to flour a tablespoon at a time until it pulls together into a rough dough. Knead quickly to form a smooth ball adding more water if the dough is too crumbly. Wrap in plastic wrap and refrigerate for one hour. On a floured surface, roll out the dough to desired thickness, place in greased pie pan and prick with fork all over. Follow whatever recipe directions you happen to be making next. If the pie shell needs to be baked, first place a piece of tin foil inside pie shell and fill with dry beans. This helps hold the crust down while it bakes and the beans can be reused in dishes and food after baking. This entry was posted in Dessert, Recipes, Sides and tagged baking, pie, tart. Bookmark the permalink. I have to admit that I wish this recipe was around several years ago when I was experimenting with (apple) pie crusts. I’ve learned to trust your recipes and this one would have saved me a lot of guess work, not to mention the poor apples. No matter. Thanks for sharing another great recipe. Thanks, John. With so many fabulous cooks in your family, including you, that means a lot. Great pie crust recipe Greg! Oh this calls for a special meal! Wow, that looks beautful and you make it sound so easy, any tips for how you crimp the edges so evenly? It takes practice. I just pinch it between my thumb and forefinger at even intervals all around. This is such a fantastic tutorial. I have a bit of a fear of making pastry but this makes it look so straighforward. Love the tips about the butter and flour – exactly how I like to cook. Thanks so much – will be giving this a go very soon and will let you know how it turns out for me! If you’ve mastered that, you can master this! It took me ages to consistantly get a good pastry- years and years. I usually put vinegar in, but I have no idea why- it’s just seems to work! …actually I’m feeling a little peckish, a slice of pie would be just the thing. My mom’s are still better than mine. And mine have improved over time too. That photo is fantastic, keep thinking up of all the different fillings that could be used . . .
Don’t you find it’s a bit too rich with just pure butter? I always try to make it half butter / half vegetable fat because it’s so rich otherwise. Looks really pretty though! Too rich? Not for my blood. I think since it’s filled, the butter doesn’t overwhelm. Wait – did you just make and unmold that beautiful fluted crust to photograph it? And it stayed in one piece? My sister (Chunklet’s mom) has requested a pecan pie with homemade crust. I’ll be following your technique for sure! Have to tell you I LOVE your blog. Made several of the recipes and have my only little Rufus Foldder set up to save them. Keep it up! I always make more than I need so we can sprinkle the leftover with cinnamon and sugar, which is my kid’s favorite party. Looks like a beautiful crust. The big question is what kind of pie are you making? Guess I’ll have to tune in tomorrow. Thanks for this very useful and informative post. Even though I use ready-made crust most of the time, I only buy the 100% butter one and if I make mine I also only use butter. I think not only the taste but the texture is also important (although I have never used pork or beef fat, I am wondering what the taste would be like…). I also use the beans trick. I have a big jar of old beans I use only for blind baking. The beans are a great tip! Vinegar? In pie crust?? How? Why? Tell us more… please!! It’s a chemistry thing that’s beyond me. The acid makes it more flaky, relaxes the gluten. I use to make pie crusts all the time. Now, I need a little practice with kneading the dough, it you work it too much you over work the gluten and it doesn’t come out right. A fews years back I had a food science class and one of our lab assignments was to make pie crust. We had about 7 mini kitchen stations, our group had margerine to make the pie crust….didn’t come out b/c margerine has a high water content compared to butter. Lard had the best results with butter coming in second, acording to our class group discussion but that was for the perfect flaky crust. Butter won all around for flavor and color. BTW your pie crust looks perfect! 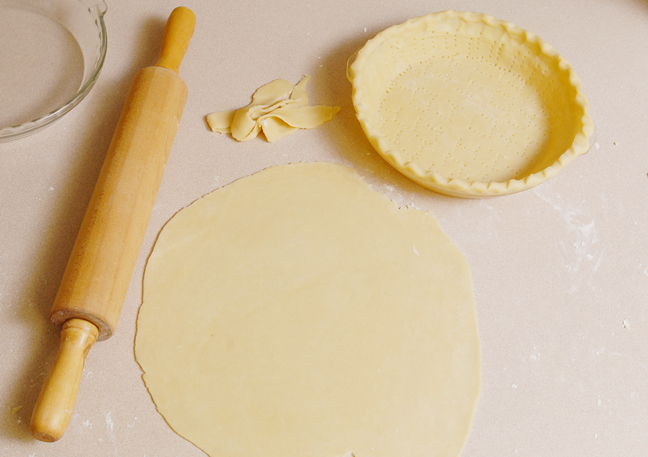 I hate to admit this, but I’ve never made a homemade pie crust! Maybe it’s time I did–thanks for sharing your recipe! Pure and simple, I totally agree with your recipe. Of course, I do add vodka.. 🙂 but you know me. It was my switch from using vinegar in the past. Sooo…I know SOMETHING is going to fill that pie crust…please do tell!!! I am not a good pie maker; my crusts are usually tough, probably from over working the dough! I will try this crust, perhaps with John’s thingamajig when I get back to the city. I think his thingamijig had its own great crust, with cheddar if I recall. But yes, try this. I hope you like it. You’re probably right, Greg. Although the iPhone is an amazing gadget, it’s kinda small to do serious searching and reading! Back to reality! very happy to have a basic pastry recipe for pies and other yummies. I will try this with cinnamon rolls and see how i make out. thanks! I’ll have to try this one! My mom’s recipe uses shortening, so I’d love to try one that uses butter! I swear, I don’t think I’ve ever seen a cleaner, more delicious looking pie crust + work bench than this one… Amazing job well done!! Great tips! This is a lot like my crust recipe, but I never bothered with the refrigeration step. My crusts were always very tasty, but tended to be a bit smushed and hard to roll out. Now they will be delicious and pretty! You did a wonderful job with this pie crust. I wonder what pie you’re making but your pie crust looks amazing. You know I love pie crusts – this is beautifully done. I love a butter crust! I think I’ve been avoiding pie crust for the past several years, but finally bit the bullet last week and it was a success! The crust, anyway… Love the photo! Great to hear! And thanks. Your pie crusts look easy to make & thanks so much for the useful tips too! I only made pastry myself a few times & this one looks like a real winner!